Also known as Oughty Craggy. 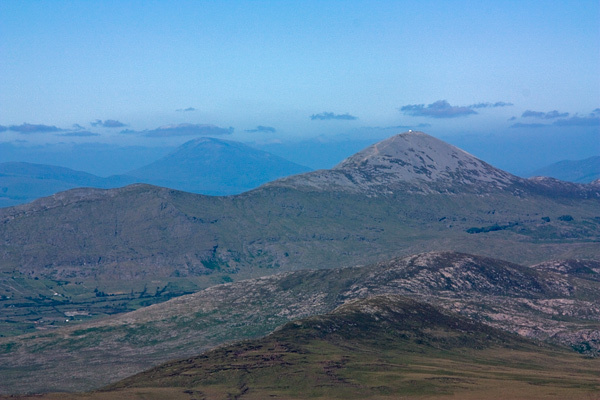 Ben Bury is the third highest mountain in the Mweelrea Mountains area and the 44th highest in Ireland. Picture from group : Ben Bury (left) is the flatter cousin to the peaky Ben Lugmores. Picture: Ben Bury (left) is the flatter cousin to the peaky Ben Lugmores. Flattish top, though steep north side with good views. Unlike its pointy neighbours this summit is a 500m long East-West scarp. It has a steep northern side and broad high area to the south, lightly strewn with stones and boulders. It is easiest reached from the West via Mweelrea or East via "the Ramp" up from Coum Dubh (the Sruhauncullinmore valley). The Ramp starts at the east of the valley and takes you to the col between Ben Bury and Ben Lugmore (West). Other ways to reach the top include coming from the Ben Lugmores. Access and parking is available from the R335 at the head of Doo Lough, at L82826950 A.
Ben Bury has good views including towards Croagh Patrick twinned from its viewpoint with Nephin. We parked the car near a picturesque small jetty at the south end of Doo Lough at L845677 B and walked on the Dhulough Pass Road to find a track that meanders inland on the narrow neck of land between Doo Lough and Glencullin Lough towards the Sruhauncullinmore stream. Insects drifted languidly in the still air and the surface of Doo Lough was like a mirror which vividly reflected the snow covered mountains that we were to tackle. We took a route which led us over the Sruhauncullinmore stream towards the boggy bed of the coum and then headed right towards a grassy spur at the bottom of Ben Bury’s East Ridge. After a hard pull upwards past some rocky outcrops on Glencullin we came to a strange line of sandstone boulders akin to a giant’s hedge, left behind eons ago by retreating ice. Here we paused for refreshment taking time to enjoy the view of the long ribbon of golden sand marking the boundary between land and sea near Barnaboun Point, the myriad islands beyond dancing and floating in the mottled sunlight reflecting off the vast expanse of ocean and, inland, the sun kissed snow covered peak of Croagh Patrick. The next part of the route became a scramble upwards over good grippy sandstone. The turf began to freeze and before long we were treated to the sight of a frigid lake. Patches of snow began to appear on the ground and after deciding to strike upwards for Ben Bury’s North East Ridge via a traverse of the north face of the mountain that was encrusted in places with icicles as thick as organ pipes, we put on our crampons and donned our ice axes. We now moved steadily upwards following the tracks left by a fox. Once on the ridge we were treated to a good Scot I grade climb, and had to kick and cut steps on the steep ascent to the top. The views from here were breathtaking; Mweelrea, lit by shafts of sunlight radiating through broken cloud looked menacing and magnificent in its winter glory, and behind this rocky giant lay Killary Harbour shining like quicksilver. 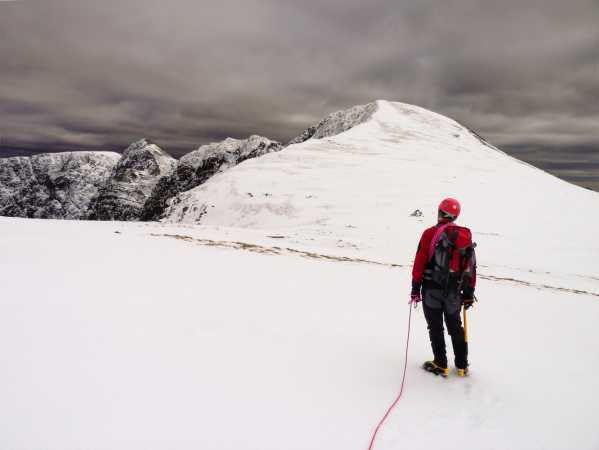 Having climbed Ben Bury via a traverse of the north face and ascent of the NE ridge on the previous day we decided to try to tackle the mountain straight on by a direct winter ascent up a prominent gully at the western corner of the main Ben Bury corrie. The gully can be clearly seen on the approach in from Doo Lough as it leads upwards to the col between Ben Bury and Lugmore East Top. The top of the gully merges with the top of the 'ramp' route to Ben Bury. I don't know if the gully has been climbed much in normal conditions but in winter, filled with snow and ice, it was an opportunity not to be missed. To reach the foot of the gully we walked into the corrie below Glencullin and followed the stream to the right before veering left and up to a short scree slope at the foot of an upward trending grassy ledge (L8091 6791 C) at an altitude of about 460m. The grassy ledge soon turned out to be underlain by loose unconsolidated scree which made the going difficult until we reached the snow line. Soon the ledge began to peter out and we were forced to drop down about 8m into the gully proper (a rope belay was a necessary protection on the climb down). It may be possible to avoid the climb down by entering the gully lower down the hillside. Now the main ascent of the gully began at about 590m and continued almost straight upward for over 140m at a slope of 45 degrees or more up the col. 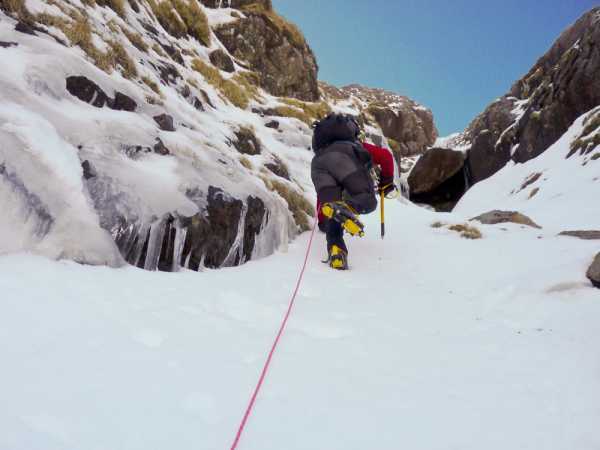 There was deep snow in the gully and the use of crampons, ice axes and a rope were essential. In some parts we could kick steps in the snow but in other places the snow was too hard or the slope too steep that we had to cut steps with our ice axes. Before each step it was critical to lunge our axes fully into the snow to make a secure belay as any slip would probably be serious. About half way up the gully there is a large boulder (or outcrop) which almost completely fills the gully. In normal conditions it might be possible to squeeze past this up a chimney on the left but on this day the chimney was blocked by unstable and hence unclimable ice. Fortunately this obstacle can be bypassed by a short climb out of the gully to the right before dropping back down in the gully after the boulder. From here onwards the gully narrowed and as we approached the top we were occasionally showered by ice debris being blown down the gully from the surrounding cliffs. Just before the very top the gully widens slightly and is joined by the 'ramp' route on the left and the combined gully and ramp soon open out onto the col.
Picture from csd : The summit cairn on Ben Bury, with Ben Lugmore West Top in the distance. 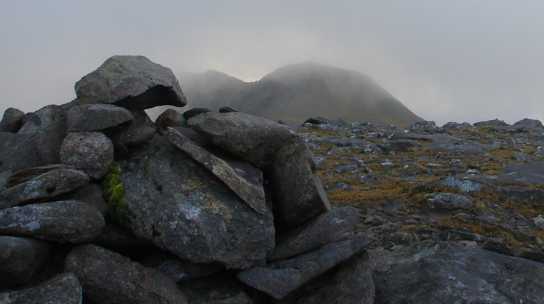 Picture: The summit cairn on Ben Bury, with Ben Lugmore West Top in the distance. Picture from simon3 : Views north east. Croagh Patrick, magnificent from most angles, is complemented in this view from Ben Bury by the solitary and equally shapely Nephin to its left. A magnificent mountain indeed, though Croagh Patrick is preferably seen at a sufficient distance to mask the path gouged out by the hordes. The small white dot at the top is a church incidentally.